Minimum order is 5 plants. Mix & Match or order 5 of the same species, your choice! All plants are perennial & come in deep 3.5" square by 5" deep pots. We do not sell seed. All plants are nursery propagated in south-central Kentucky & most come from local source seed (see About Us). No plants are harvested from the wild. Shipments are mailed out at the beginning of the work week. Shipping is via Priority Mail 2-Day via the U.S. Postal Service. Customers from other states are welcome to phone for separate shipping arrangements. Sorry, we do not ship to California, Alaska, Hawaii or Canada. Topped with dense clusters of yellow pea-like flowers in mid-summer, Wild Senna makes a great hedge resistant to deer and rabbits. Low-maintenance. Although shrubby in habit and therefore also included under "woody" here, it is an herbaceous perennial as it dies back to the ground each winter. Sought as a pollinator host plant (Sleepy Orange, Orange-barred Sulfur, Cloudless Sulfur, Silver-spotted Skipper butterflies & the Black Witch moth with wingspan to 7"). Grown from Kentucky-source seed. Larval host plant for the black and iridescent-blue Spicebush Swallowtail. The caterpillars are adorable, curling up in a leaf, with "eyes" to deter predators. Spicebush is a shrub that has highly aromatic foliage when crushed and turns a lovely pale yellow in autumn. Female bushes bear bright red fat-rich berries that are highly prized by birds. Grown from Kentucky-source seed. 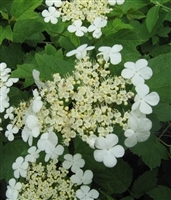 Medium sized shrub with clusters of lacy white flowers. Excellent choice for planting in groups along edge habitat in a woodland garden. Also good for rain gardens and along streams. Host to the nifty Hydrangea Sphinx moth with 2" to 3" wingspan. Grown from Kentucky-source seed. Shrub. 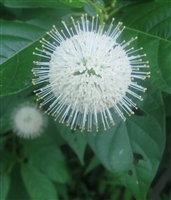 Showy white flowers borne in spherical clusters draw numerous pollinators. Bees use nectar for making honey, seeds feed wildlife. Great for borders, rain gardens or as a specimen plant, even erosion control. Larval host plant for a number of species of Lepidoptera. Prune to desired shape. Grown from Kentucky-source seed. In spring Redbud is fully loaded with purplish-pink blooms that support pollinators at a critical time of year. Leaves are heart-shaped and tree has graceful spreading form. Larval host plant for Henry's Elfin butterfly and several species of moth. Grown from Kentucky-source seed. Although NOT a woody plant, this plant fills out like a bush but dies back to the ground each winter. 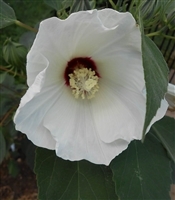 Rose Mallow flowers are large, 4" to 6" across and showy. 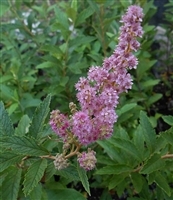 Ideal for a rain garden, hummingbird garden, or grouped along a patio, pond or ditch. Trim to desired height. A larval host plant to the following butterflies: Common Checkered Skipper, Painted Lady, and Gray Hairstreak. Larval host to the following moths: Yellow Scallop moth, Io moth-very cool, and Pearly Wood Nymph. Grown from Kentucky-source seed. Well behaved shrub producing showy fall fruits with hot pink capsules and dangling orange-red fleshy arils. Fall foliage is a wonderful crimson attached to the bright green stems. Attracts birds. Grown from Kentucky-source seed. Clusters of white-pink spirea-like flowers bloom in spring, pink fruit (pictured) and exfoliating bark in fall & winter give this shrub multi-season appeal. Good for erosion control, specimen & hedges. Larval host to many (40) native Lepidoptera. Upright shrub tolerant of a wide variety of soil types and good for stabilizing embankments or creating a boundary or hedge. Flowers to 1" in diameter. Grown from Kentucky-source seed. Delightful mounding shrub with arching stems that produce drooping fragrant racemes of white flowers. Excellent for rain gardens, border, or adjacent to a pond or stream. Can sucker to form colonies. Also known as Wafer Ash, it is a large shrub useful for an informal hedge or privacy screen. Interesting fruits are clusters of 1" discs. It is a host plant for the Giant Swallowtail butterfly. Look for tiny brown eggs or tiny "bird droppings" in late summer (see photo). Winter interest provided by clusters of flowers appearing very late in the year. Showy & fragrant, these flowers have 4 ribbon-like yellow petals. Excellent for a use in a woodland garden or as a hedge, screen or border. Also good for erosion control. Multi-stemmed shrub with clusters of mildly fragrant 1"-2" white flowers with 4 petals & yellow stamens. Good native alternative to invasive Japanese privet, it can be used for foundation plantings, hedges, & for privacy screens. Trim back after flowering. (Pictured is similar species: Scentless Mock Orange.) Grown from Kentucky-source seed. Shrub with a rounded form, fragrant flowers that attract hummingbirds and yellow-green stems in winter. Deep roots makes this plant drought-tolerant but difficult to transplant. Also called Cinnamon Clethra, this is a larger, more vertical shrub than Coastal Sweet Pepperbush (C. alnifolia). Fragrant racemes of white flowers mature into peppercorn-shaped capsules. Foliage is a glowing golden color in autumn & attractive bark is a peeling reddish-brown or cinnamon colored. Clump-forming via suckers. In nature found in rich mountain woods & along streams. Grown from KY-source seed. Also known as Indian Cherry, this small tree abounds with ornamental features & despite the common name, bears no thorns. The air is a-buzz with the sound of pollinators when flowering. Glossy green leaves are ornamental as is the fall fruit which turn from red to black. Fruit provides food for birds at a critical time of year. Grown from Kentucky-source seed. A good choice for a low hedge, in a rain garden or adjacent to a stream or lake. Pretty pink terminal flower spikes bloom in late summer. Trim in winter or early spring as flowers occur on new wood. Spreads by suckers. Grown from Kentucky-source seed. There are separate male and female plants. A male plant is needed for the female to produce fruits. Bright red fruits remain on plant after leaves are shed in autumn providing cheerful winter interest. Berries help support birds in winter. Fruits are a bird favorite. This plant can proliferate by self-seeding & consider planting away from surfaces which stain from fruit, such as a sidewalk. Male and female typically occur on separate plants. Grown from Kentucky-source seed. Also called Black Gum and Sour Gum, this tree turns a stunning scarlet red in the fall. Flowers are an excellent source of nectar for bees. Fruit on female plants attract birds. Grown from Kentucky-source seed. Copyright © 2013 Ironweed Native Plant Nursery. All Rights Reserved.